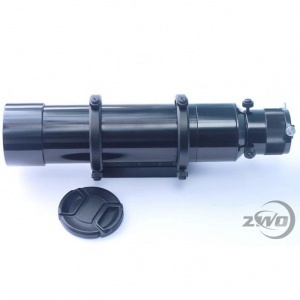 The ZWO 60mm guide scope will be a good addition to any ZWO CMOS USB camera that we sell, especially if you want to use the camera as a guide scope. It comes with a rotating helical focuser with 30mm focus travel. The helical focuser has got three thumbscrews to stop any flexure whilst guiding. So, once you focused the camera, secure the helical focuser with these plastic thumbscrews. Thanks to its modular design, by removing the last 40mm section of the tube (nearest to the focuser), we gain enough back focus to accomodate a dSLR camera behind the focuser. You'd also need an optional camera-specific T-ring and a T-thread to 1.25" nosepiece adapter as well. This way, you get a fast f/4.67 tele lens of modest quality. This is of course not the main attraction of this scope, but why not to try it?